Tuesdays at my house have become my favorite day of the week. It's my day to take Ella to our local library before she heads to pre school for the afternoon. 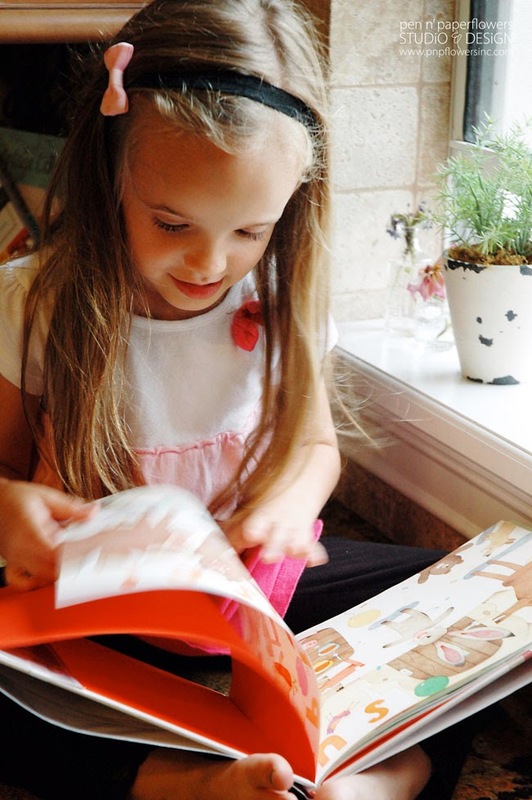 She's got her own library card now and looks forward to swapping out her current five books for five new ones. (We picked the number 5 since that's her age and it completely eliminates the need for me, or her, to remember how many books we need to return every week). 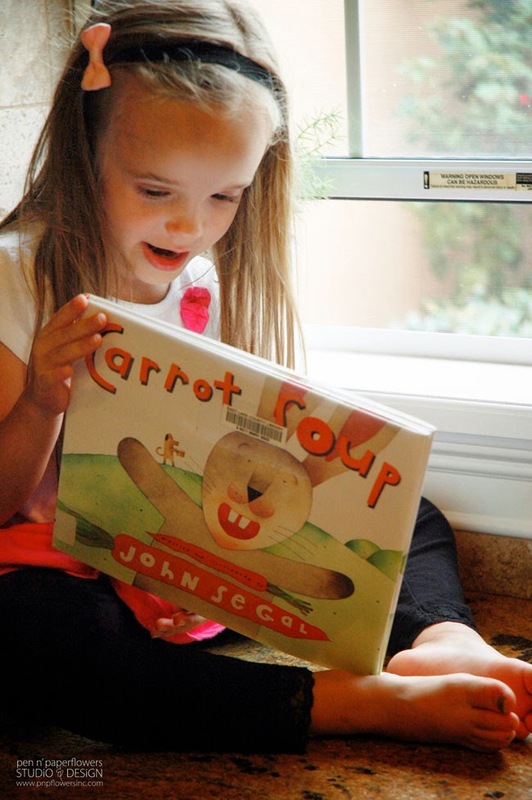 This week, however, Ella did not want to return one of the books we found last week…Carrot Soup. She was really upset about the thought of having to take it back so we re-checked it out and have it for another 5 days. 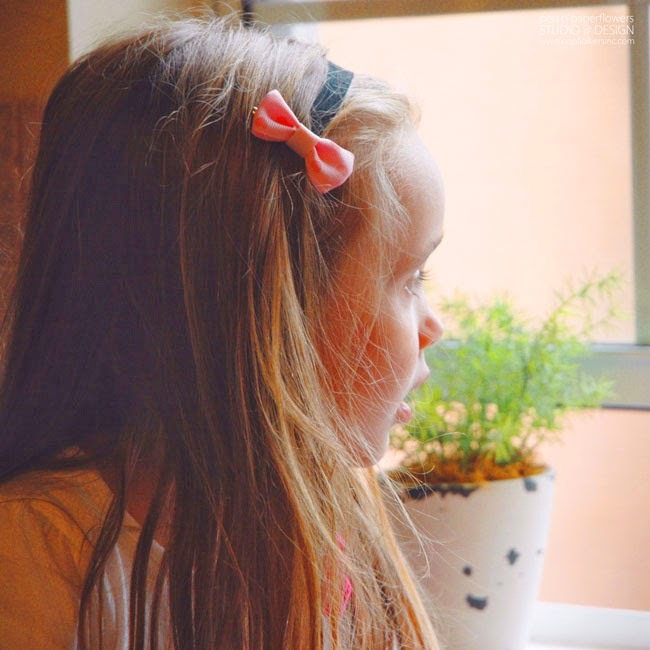 She's been enamored with this adorable story about a rabbit whose carrots go missing in the field after he's worked so hard to plant and harvest them. He'd been so excited to finally have carrots to make his very favorite soup. There's even a simple recipe included on the very last page of the book…and I've already made it! It's DELISH. (I'll be sharing it on the blog soon). she was hiding her face because she was done with me taking pictures. Ha! Books are magic. Strangely enough I didn't feel that way when I had to read them as a kid. It felt more like a chore or a good way to lull myself fast asleep. Guess I just wasn't reading the right ones? I remember my friends being peculiarly into them and not understanding AT. ALL. 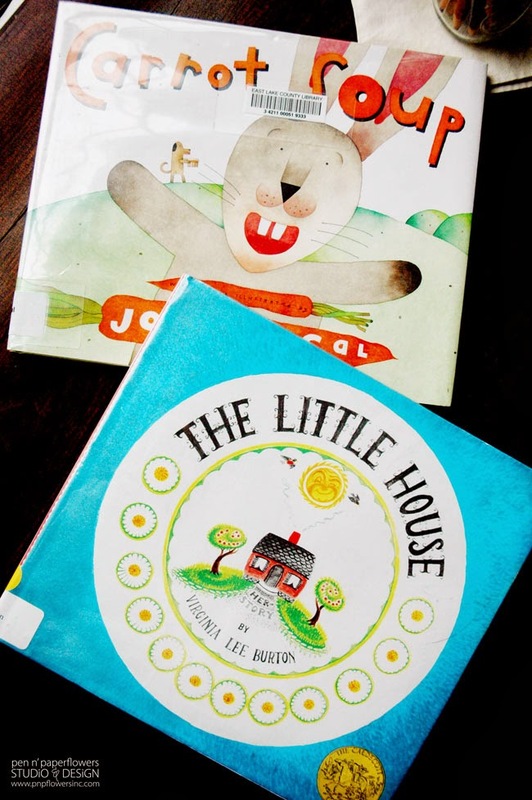 This week, when we re-checked out Carrot Soup…we also brought home one of the books I remember reading (and actually loving) as a child: The Little House. For whatever reason, I remembered it one day in the library and asked if they happened to have it. They didn't have it and had to order it from another library so I was thrilled it was there when we came this week. It's such a charming little book and I find it interesting that the elements of a story I adored as a child actually define the very essence of my personality today as an adult…touching on things I adore and things I hold near and dear to my heart today… cute little cottage-style houses, country living, open fields, star-filled skies, nostalgia, family history, and giving new life to old architecture, etc. Anyone else remember this story too? Anyway…on this particular day, Ella was on the kitchen counter reading Carrot Soup to me and as if that wasn't magic enough…what happened next was even more magical. I had the window cracked open a bit (and the french doors to the back patio open). 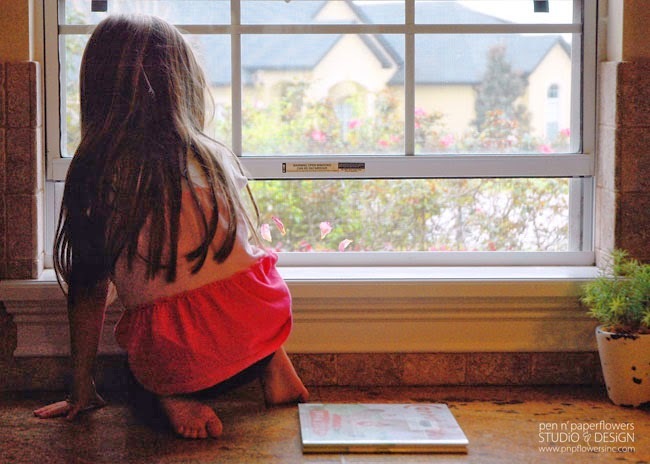 Ella laid her book on the counter as the sound of the wind coming through the screen caught her attention. Next thing I know, she begins plucking off the petals and leafs of some wilted flowers we'd put in small bud vases the week before. 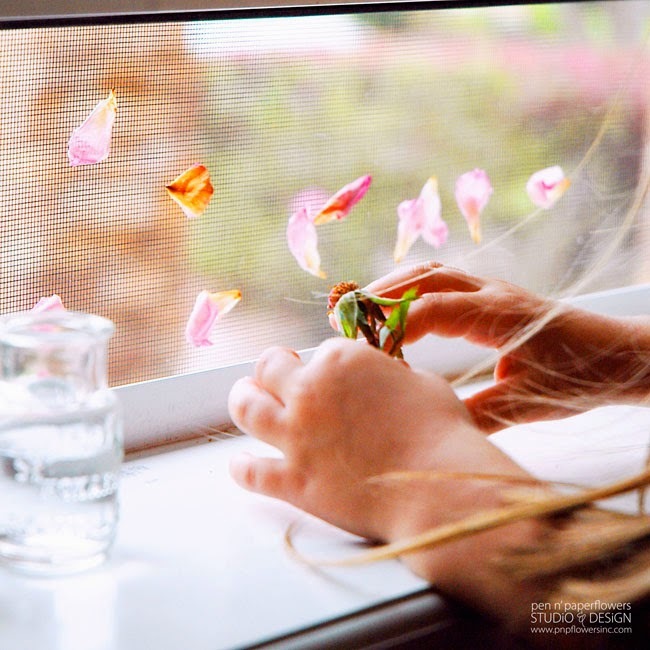 Ella discovered the wind coming through the window created just the right amount of "pull" to hold the petals and leaves up against the screen. I know it sounds silly but it truly was magic in Ella's eyes and the magic for me was in her sweet intrigue…and the fact that she was taking the time to do this. 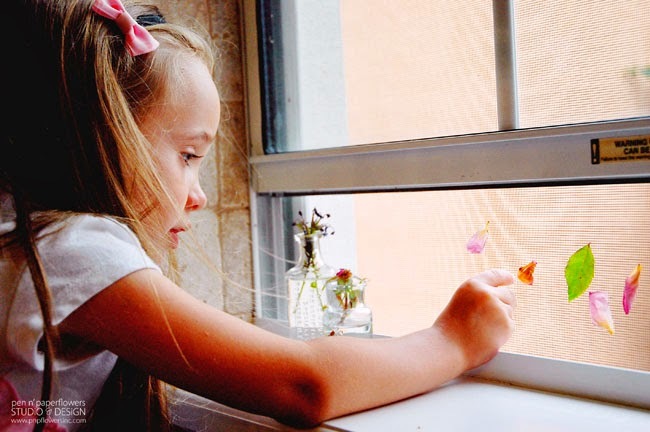 I was mesmerized by her sweet little five-year old fingers and hands gently pulling and placing each leaf and petal…just as much as she was fascinated by the wind holding everything in place. Reading books to Ella is a ritual I look forward to every most nights. (sometimes when I find myself having to work on the computer after dinner I get irritated having to stop and interrupt my train of thought on the particular project I'm in the middle of). On those particular days, it never fails. 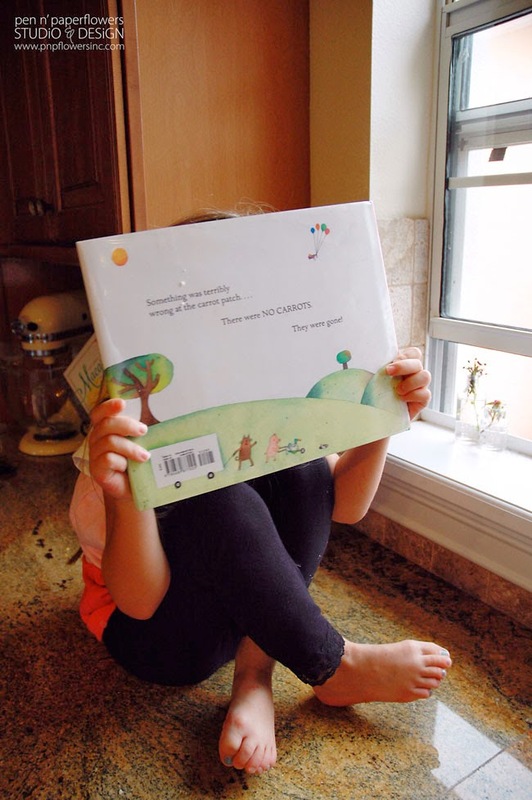 As I march my grumpy self to the couch to meet Ella with the book she's picked, my heart kicks me in the gut as I look at Ella's sweet little face and realize yet again…these days are numbered. Having 2 older girls 10+ years older than Ella makes the reality for me that bedtime routines change dramatically as they continue to age and I will ache for the days when she was small enough for me to cuddle in my arms and young enough to actually still WANT me to read her a book. I experience that ache right now with Clara and Ema. Your post filled me with such nostalgia! I relished in my weekly visits to the library...and my parents' patience in letting me spend at least an hour picking up books. 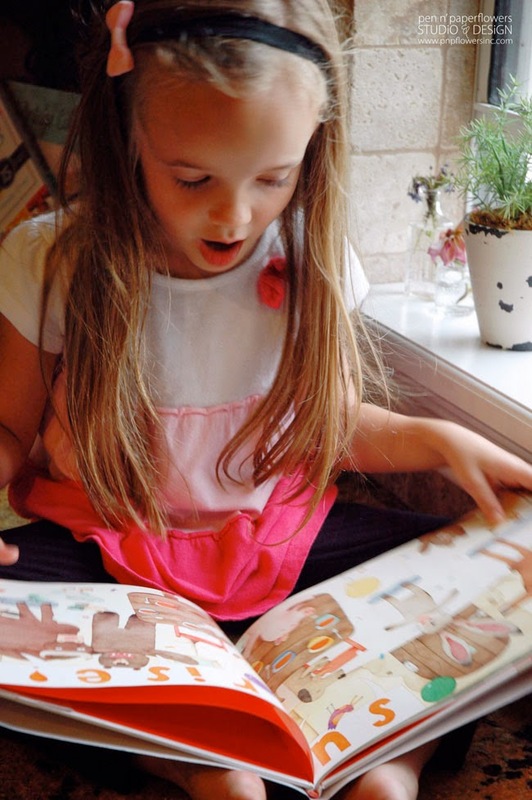 It's wonderful that you have nurtured a love for books in Ella. It's certainly something that can last a lifetime! It ALMOST goes without saying that Ella is absolutely adorable.